A few days ago i was telling everybody about the gold chain leather belt i wanted, and the dilemma between choosing the Miu Miu one, or similar looking, cheaper one from Aldo. Well, after carefully looking into my wallet, i finally bought the 30 euros belt from Aldo, and for difference i treated myself with some more Frederik Fekkai hair products. 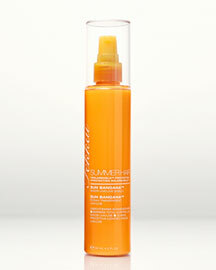 An invisible heat-activated shield, to protect my hair from drying and frying when exposed to sun, salt or chlorine. It is oil free and color safe.